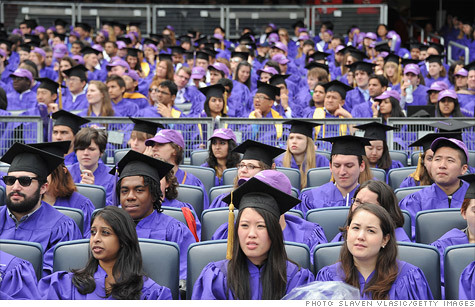 More college graduates are filing for bankruptcy, according to the Institute for Financial Literacy. NEW YORK (CNNMoney) -- Bankruptcy has gotten more educated over the past five years, as financial distress spread to more of the population with college degrees, according to study results released Tuesday. "The Great Recession has had a dramatic impact on the bankruptcy filings of American consumers across the economic spectrum -- including college-educated, high-income earners," said Leslie Linfield, executive director and founder of the Institute for Financial Literacy, which conducted the study. While those who didn't graduate from college make up 70% of debtors, the study found that the rate of college graduates filing for bankruptcy increased by 20%. "While less educated, low-income individuals continue to represent the typical bankruptcy filer, this report underscores a sophisticated evolution of the profile of the American debtor that now extends to disparate age, income and ethnic groups," Linfield said. The study involved more than 50,000 respondents and ran from 2006 to 2010, tracking the financial status of debtors since the passage of the Bankruptcy Abuse Prevention and Consumer Protection Act. Not surprisingly, the rate of unemployed Americans filing for bankruptcy increased by 21% since 2006. But since the study was first conducted in 2006, there has been a gradual shift in bankruptcy filings toward higher income earners. In 2006, only 5.5% of the debtors participating in the report made more than $60,000, but this income bracket shifted to more than 9% by 2010. Married Americans were hit particularly hard, experiencing a 12% increase in bankruptcy filings since 2006. Married people represent more than 60% of all filings. Of those filings, nearly 35% were joint petitions, the study said. "Married was the dominant marital status of those seeking bankruptcy protection between 2006 and 2010," read the report. When asked about the causes of their financial distress from 2006 to 2010, increasing rates of respondents reported that they were overextended on their credit, had experienced a reduction in income, or had lost their jobs. Other causes, such as unexpected expenses, death of a family member, illness and injury, showed a decrease over five years. The study also explored the racial demographic of debtors. The rate of whites and Native Americans filing for bankruptcy was little changed over five years. But the percentage of Asian- Americans who filed for bankruptcy more than doubled, from 2.1% in 2006 to 4.5% in 2010. The percentage of Hispanics filing for bankruptcy also increased, to 8.7% from 6.5%. African-Americans were the only ethnic group to show a significant decline in bankruptcy filings, to 11.3% from 15.4%. Is money pulling your marriage apart?